This is a regular blog post. If you’re looking for snow notes or links to show audio or video, please keep scrolling. It’s all right here! I’m spending a couple of days here on the Space Coast, mostly in and around Titusville, Florida. I arrived Wednesday night to assist David Allen with an unfortunate infestation of Leinenkugel Berry Weiss. I’m pleased to report that the fridge is now nearly Leinie’s-free. And we took care of some pesky ribeyes while we were at it. I’m writing this at the Starbucks at Target in Titusville which, although possessed of the usual high-quality caffeinated beverages, has no WiFi. Thus, please pretend that this was posted Thursday afternoon instead of late Thursday night or early Friday morning. Not that timing is all that important usually, but I’m heading out to the Cape this evening to see them roll out Endeavour for STS-134 and I’m bound to have pictures and other assorted media to post right after this goes up. On the way back from getting my NASA badge (let me say that again . . . On the way back from getting my NASA badge), I decided to take a swing by the Space Coast Executive Airport, the site of the Valiant Air Command TICO Airshow, which will be my first of the season. This is the first year that I’ve started the airshow season this early, but an amazingly kind offer by the Starfighters was too good to pass up. Thus, I’ll be spending the day Friday on the ramp with the performers and drooling (respectfully, mind you) on some F-104s. I found my way to the ramp area just as the Heavy Metal Jet Team took the box for a practice flight. Heavy Metal has captured the imaginations of many, and for good reason. It’s a five-ship demo team that’s both entirely civilian and entirely sponsored. That means that the shows that don’t get a big military jet team (Thunderbirds, Blue Angels, Snowbirds, etc.) can still have a jet team as a headliner without the expense that would normally be associated with a civilian team. Heavy Metal is a five-ship team. 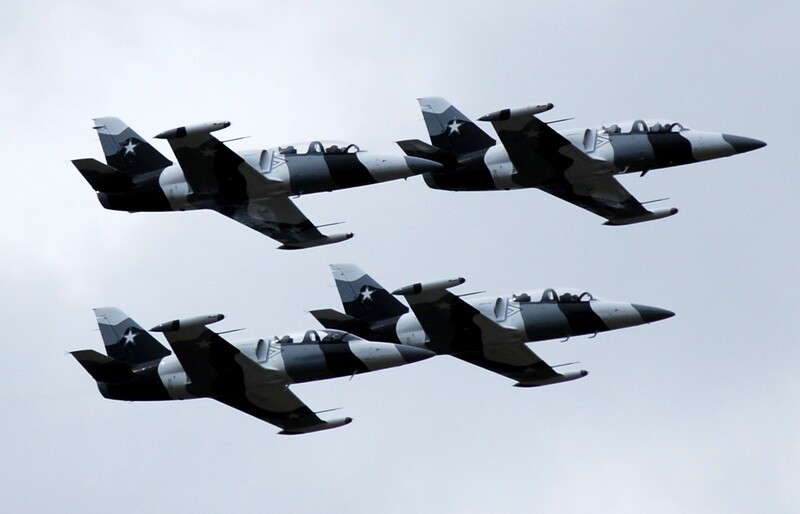 A lead T-33 Shooting Star/Silver Star flown by Dale “Snort” Snodgrass (but an L-39 substituted this weekend) and four L-39s flown by 1/Team Lead Jerry “Jive” Kerby, 2/Right Wing Jared “Rook” Isaacman, 3/Left wing Doug “H-Dog” Demko, and 4/Slot Sean “Stroker” Gustafson. I shot a lot of pictures and watched the practice pretty closely. It was a rotten day to shoot airplanes. Gray overcast all around with jets pained in arctic camouflage. So these shots aren’t going to grace any posters or magazine covers (not that any of my stuff ever will – my shtick is strapping into the aircraft and emoting for the cameras and on audio). But I think that I saw enough to make some worthwhile observations. There’s a lot more interesting geometry to what I saw than you usually see from a civilian jet act. 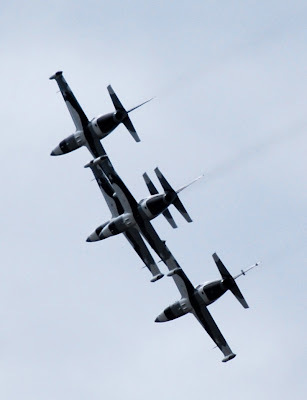 Most civilian jet teams usually just swing back and forth along the 1,500-foot line with formation passes. The most interesting stuff in those cases are the breaks where each of the jets in the formation takes a bit of a solo in its break before landing. Otherwise, it’s echelon passes, finger-four, line-abreast, etc. Not that I don’t love that. (I do!) But it’s kind of flat. Heavy metal gets a lot more three-dimensional in its performances. It’s tough to do that for a number of reasons, probably the biggest of which is the fact that you’re not supposed to direct aerobatic energy at the crowd. If the aircraft goes to flinders at any given point in the show, the momentum has to be in a direction that will cause the the debris to land outside the crowd area. Think about it. Even the big sweeping dedication passes or photo passes are usually from way out behind the crowd’s flank and around in front so that the outside of the turn is toward the safe area out on the field or on the other side of the field. But it makes a big difference if you can get some elements going toward, or away from, the crowd to beak up the monotony of the back-and forth. I’ve seen Gene Soucy, Greg Koontz, and other piston-drivers do this because they have smaller, slower aircraft. Gene can point the Show Cat right at the crowd for a few seconds and do it safely because he’s going slow enough that he can turn well before any aerobatic energy could reach the crowd if something goes amiss. It makes for dramatic shows. Maybe it was just a practice and maybe I didn’t see the actual routine that Heavy Metal is going to fly for the crowd. And maybe it’s because I saw it from over at the terminal side of the field, which is in the box. Whatever the case, it seemed that the solo gets a lot of to-and-fro (as opposed to back-and-forth) in the performance. Much more than simple passes. And he’s working pretty hard and putting as much of that as possible into the show. The four-ship formation element is just plain stinkin’ tight. Oh, holy crap are they tight, especially for one of the very first shows of the season. Lots of overlap. 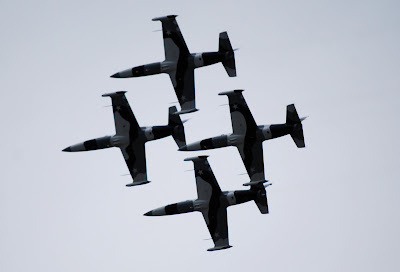 Really close formation. Well-coordinated. On at least one case I got that “hey-it’s-one-big-airplane” sensation, as illustrated in this shot as the team does an excellent imitation of Virgin Galactic’s EVE (fka WhiteKnightTwo). Hard to tell in the picture, but the four-ship hung exactly for the whole turn. Makes me want to just give up and never look at a Pitts again, much less a Citabria. But you know that I’ll swallow my pride and try again to approximate that kind of precision. Soon. 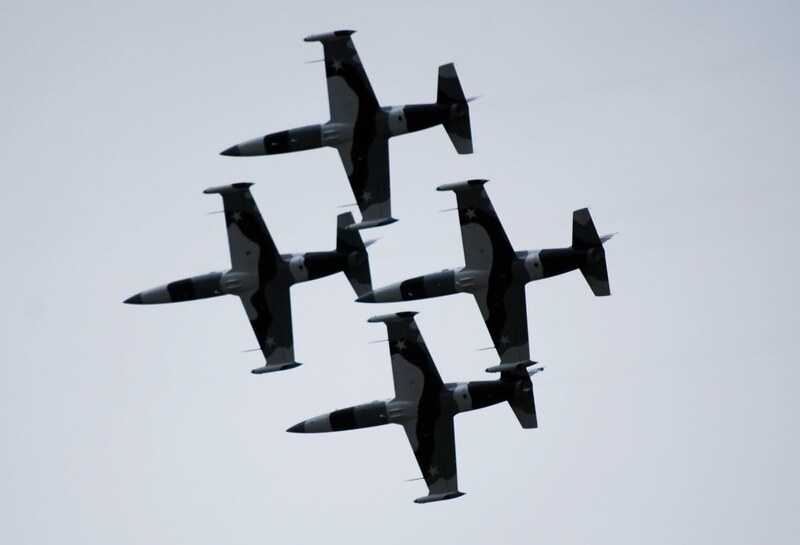 Lastly, and probably most impressive for the crowds, the four-ship actually does formation acro in the style of the military jet teams. I’m not aware of anyone else who does that. They’re not the Thunderbirds or the Blues. They really can’t be because they’re flying jets with a 0.37 thrust-to-weight ratio. So at least half of the usual military maneuvers are off the table. But the team does an excellent job of managing the energy that they develop and they keep it pretty close to the crowd for more of the fight time than the other teams do. Bottom line? The airshow faithful and those who understand aerobatics and energy management are going to love watching this team. I did, even on a crappy-weather day watching a practice. The rest of the crowd? Really, the only thing lacking is the big noise. These jets are pleasantly noisy and they smell right from just downwind, but they don’t grab you by the scruff of the neck and beat you in the chest with sound pressure. I think that Heavy Metal has a great back story, a talented group of pilots, and great poster-appeal. They’ve also apparently been training hard and are really tight, especially this early in the season. Hey, nobody can anchor an airshow like the Thunderbirds or the Blues. 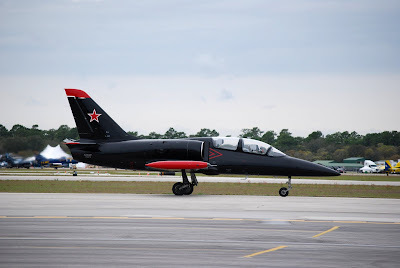 But, with both of those teams stretched pretty thin over a long season, the airshow industry has long needed an impressive act to anchor those shows that don’t get the big jet teams. I think that Heavy Metal is going to very competently anchor a long list of shows and give good account of itself. I enjoyed the heck out of watching them. They’re three-dimensional, they’re pretty, and they’re tight. They can come to my town any day and I’ll go home from that airshow with the same stab-marks on my shirt from leaning into the snow fence at the crowd line. The skies are supposed to be a lot more clear tomorrow and I’m looking forward to seeing the team tear it up again.